I know I’m being that annoying girl who won’t shut up about her amazing vacation, but bear with me while I share one more L.A. story. I have this friend ,Patrick. He’s just about the most charismatic, outgoing, lovable, politically incorrect, dapper guy out there. This guy has so many friends that I feel like I’m out with a celebrity when we walk through UCLA’s Westwood Village, where he lives. Patrick is one of those friends whom you’ll see twice a year (not by choice, but because of geographic obstacles) and it will feel like no time has passed since the last bi-annual visit. This time, we met up for dinner. I wanted pasta, so because I’m a diva, I dragged Patrick from restaurant to restaurant in Westwood to scour the menus for carb-tastic bowls of noodles that would please my picky palate. After teasing literally every hostess in Westwood, we wound up at California Pizza Kitchen, which I have unsuccessfully tried to convince my East Coast friends is merely called Pizza Kitchen in the Golden State. I ordered the chicken piccata, thinking it might be a wee bit healthier than the rest of the heavy cream infused menu items. However, what was delivered to me looked like an entire fried chicken plopped onto a disheveled nest of angel hair pasta. Naturally, I ate the whole thing. Let me tell you, this was not chicken piccata, at least not the chicken piccata I’m used to eating, which is only slightly breaded and full of lemony tang, acidic capers, and far less than the stick of butter used in CPK’s rendition. Fast forward to last night, when Patrick and I had one of those cross-country psychic moments when, after not talking in weeks, we text each other at virtually the same moment to say hello. Coincidentally, I was planning to make chicken piccata last night. My recipe for chicken piccata is dedicated to California Pizza Kitchen. Seriously guys, if you follow this recipe instead of yours, you’ll save a helluvah lot of money on butter, so maybe you won’t have to charge so much! Also, no one needs to eat three whole chicken breasts, not even me. This chicken is tender and juicy. By pounding the chicken into a thin fillet and dusting with flour, it soaks up all the yumminess from the garlic, butter, white wine, and chicken broth. Served on top of a (non-disheveled) nest of angel hair pasta and drizzled with the super rich reduction sauce, this meal is filling, yet refreshing. That fresh lemon juice wakes up the protein and carb rich meal and the white wine in the sauce lends a slightly fruity flavor. Serve with a glass of the leftover wine on the side and you’ve got yourself a meal. 1. Heat water and a hearty amount of salt in a medium-sized pot. 2. Rinse chicken breasts. Place between two sheets of plastic wrap/waxed paper or inside a Ziploc bag. 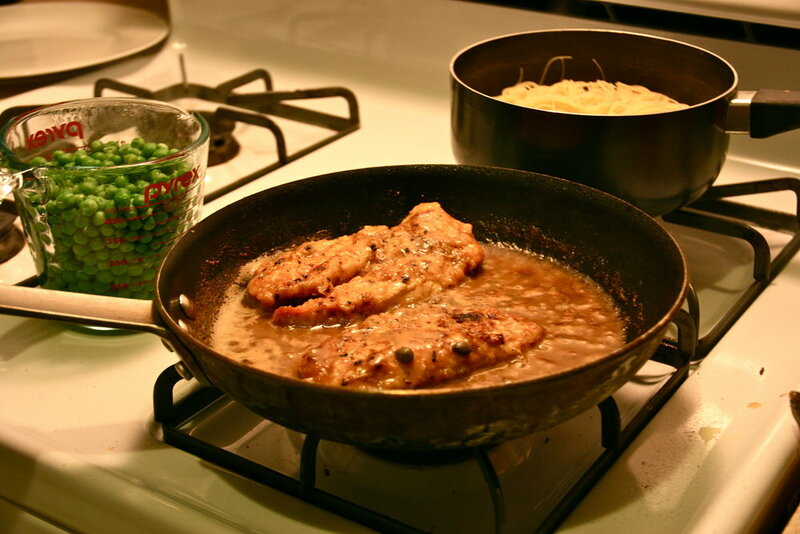 Using a small frying pan or malate, pound chicken breast to ¼ inch thick. 3. Spread flour out on a dinner plate. Season chicken breasts with salt and pepper then dredge in flour, covering both sides. 4. In a medium-sized sauce pan, heat 2 tablespoons butter and all of the olive oil. Once simmering, add garlic and sauté for roughly 30 seconds. 5. Add chicken breasts to skillet. Cook for three minutes on each side. 6. Add pasta to boiling water and stir occasionally until al dente, about three minutes. Then drain. 7. Remove chicken from pan, turn heat to low, and add remaining butter, lemon juice, chicken broth, and wine. Use a wooden spoon to scrape browned bits from the bottom of the pan. If sauce seems too thin, add a sprinkle of flour and stir to incorporate. 8. After sauce has thickened, about two minutes, place chicken back into pan, turning to coat with sauce. Add capers to sauce. 9. On each plate, create a nest of angel hair, using a slotted spoon or your fingers to shape into a circle. 10. Place chicken on top of angel hair nest. Garnish with a lemon wedge and serve immediately.